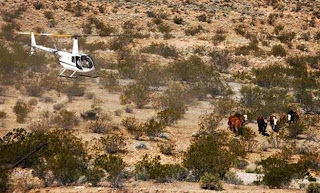 The US federal government might have just evoked the fury of animal right groups over their shocking treatment of cattle at the Bundy Ranch, and may soon face legal charges of severe animal abuse in Clark County, Nevada. Federal agency’s treatment of residents at the Bundy Ranch this past week included tasering, beating, wrongful arrest, threatening residents with attack dogs, and mobilizing a federal paramilitary force whose barrels were trained on US citizens, all in all, spending at least $3 million of tax payer money in an effort to sell stolen cattle over state lines in Utah and California. A legal argument has also been made that the US Department of Interior’s Bureau of Land Management (BLM) is now guilty of racketeering under the federal RIC) statute (Racketeer Influenced and Corruption Organizations). If all that wasn’t enough, evidence is now emerging regarding pattern of extreme cruelty and abuse, and suspected culling of animals from the Bundy Ranch. Nevada Assemblywoman Michelle Fiore has released new shocking information and images which document the horrors which BLM agents have inflicted on previously happy and healthy livestock. “If you look at the stewardship of land, and herding of cattle, first of all these particular cattle that were grazing on 600,000 acres – understand that when the Bundy family would herd their own cattle, there would be water taps to where the cattle would go down to the water and herd them humbly and softly – no cruelty, no abuse, herding them to where the cattle could get injured”. “This is the BLM’s practice. They herd animals with helicopters, ATV’s, and shotguns… If any cows get out of line – they get a bullet in the back of the head”. “Make sure the BLM are off state land and make sure the BLM are not allowed to herd cattle again”. “Near their compound, right off the highway, they were digging holes (…)… They tried to bury some cows on the compound, but I guess they didn’t dig the hole deep enough, so throw a cow in and they dirt over him and you have cows legs cows’ legs sticking up out of the dirt”. 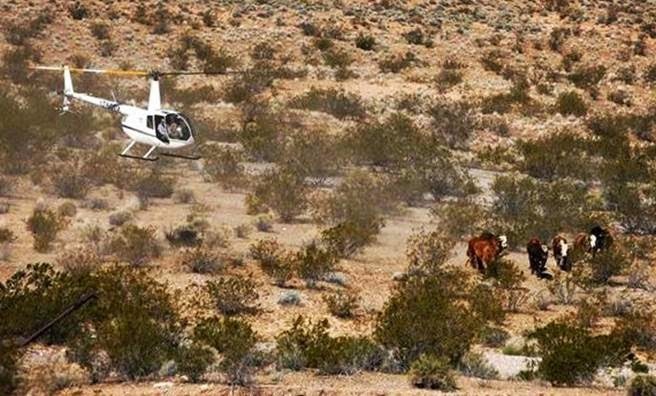 It was confirmed by ranchers and observers last week of how the BLM and their “contract cowboy” had deployed aggressive practices whilst rustling the Bundy’s herd, using tactical helicopters (image, below) forcing cattle to removal zones, often times driving cows uphill in 90F heat – a lethal practice known to cause tremendous stress and exhaustion to the animals, causing sickness and even premature death. 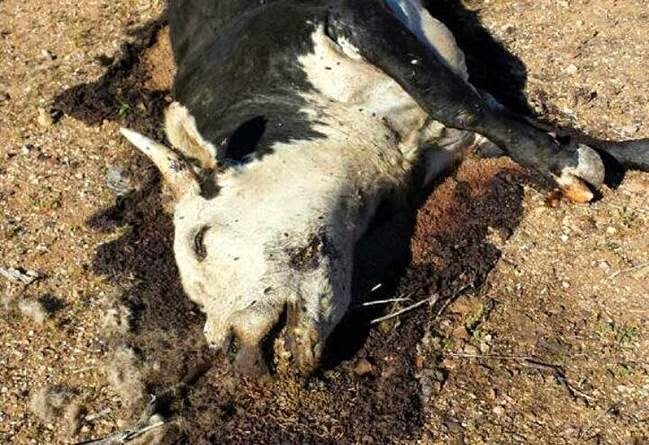 Last week, farmers suspected that BLM agents were also scooping up the dead animals with heavy equipment like Backhoe diggers, and either burying carcasses somewhere on the 600,000 acre public grazing land, or disposing of them somewhere off site. In addition, reports by observers confirmed that spring heifers who were subject to abusive BLM tactics were forced to abandon some calves behind to hide in the desert bush (a common practice by mothers who are being rustled, who later can backtrack to retrieve their young) putting the calves at risk of death. 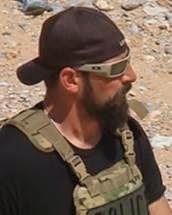 Critics now believe the BLM and Clark County Sheriff’s Office could be facing a strong legal challenge for their reckless handling of the ill-fated operation underlined by a litany of both human and animal rights abuses. PHOTO provided by Michelle Fiore – visit her @VoteFiore on Twitter.